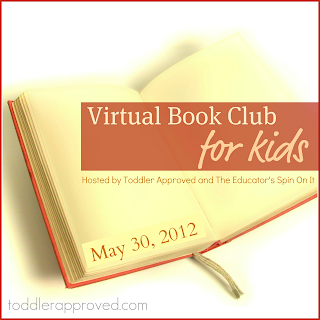 We are so excited for May's Virtual Book Club for Kids! This month we are teaming up with The Educator's Spin On It to share a new book with you!. We are inviting all of you to participate in a virtual book club with us again this month! 1. Read the book for May with your child (listed below). 2. Create a craft, activity, project, cooking experience, song, etc. (anything creative) that relates to the book and do it with your child. 3. Share it with us on May 30th via your blog, posting pictures on our Facebook page, or just commenting and telling us about what you did. 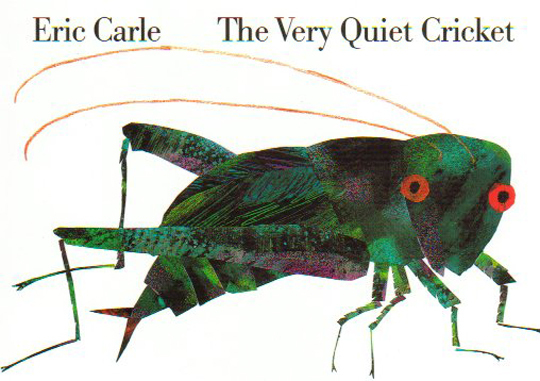 This month's book is The Very Quiet Cricket by Eric Carle. We love insects at our house and thought this would be a fun book to inspire us in our creating! I highly recommend purchasing this book to add to your Spring collection if you don't have it already. I think every house needs to be full of Eric Carle books. There are so many amazing ones! What are your favorites? If you don't want to buy the book (and don't have it already), you can check it out at your local library, or read it online for free here with your child. So, are you interested in joining our May Virtual Book Club for Kids? If so, leave a comment below to let us know that you are joining us and then get started reading and planning your fun creative experiences! On May 30th we will share our ideas with you and also post a linky so that if you're a blogger, you can link up your book club post and share it with us too. I am so excited to see all of the different things that we can create and learn as we read this book together! I hope you will join us! Haven't got any idea yet, but I adore Eric Carle's work & illustration. Yay! The Quiet Cricket is one of our favorites! We will definitely be joining up again! We have had so much fun with the last two book clubs and The Very Quiet Cricket is one of our favorites! Can't wait to join in on the fun! We love Eric Carle but haven't read this one yet. Excited to try the book club! Eric Carle is our favorite! We will definitely be joining this month! Love Eric Carle's books! Will be joining. Oh yay! We LOVE Eric Carle books. We don't have this one but we'll be reading it for sure! Oh! LOVE Eric Carle. We missed April but we will have to do this one! We love Eric Carle, we are going to try this. Awesome book selection! Can't wait to participate this month (sorry we missed last month). We're so excited to be teaming up with you for this month's Virtual Book Club and to see so many already signing up too! Eric Carle has been one of our favorite authors for many many years! Can't wait to share some "buggy ideas" with everyone! I love how their faces light up as you read the end of this book! We're in! Preschool is over next week and I'm thinking of ways to keep us busy. This is a great idea. Love it! We're in! Checking my library now! I ordered a second hand version of this book and it took so long to arrive I was worried I might miss the book club. It finally arrived yesterday - phew!